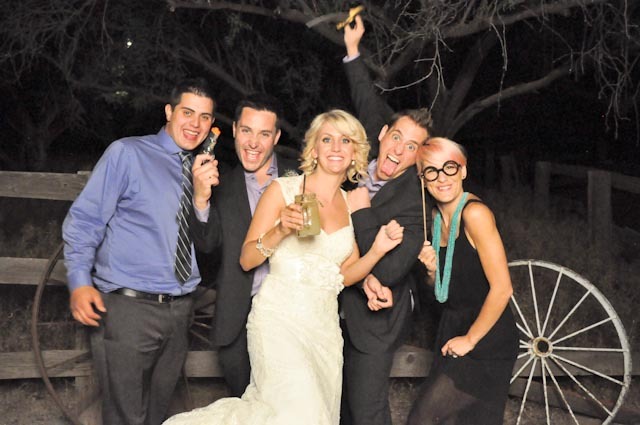 Molly and Franco had their wedding ceremony and reception at Rio Verde Ranch. This was the first time I had ever been at this venue and it was very, very cute and the event coordinator was extremely accommodating. They had built a frame for the ceremony with pale pink flowing fabric and we were going to move this to the photo booth area but it was too heavy. Instead, we just used the natural background and there were a couple of wagon wheels that we moved over for the photo booth pictures, and we just love how the pictures turned out. We went ahead and placed a red carpet where the guests were to stand and they all had a lot of fun. The caterer, Sierra Bonita Grill & Catering, served great food, and I can honestly say this is the best food at a wedding that we had ever tasted. Molly found Digital Expressions Photo Stations on weddingwire.com. You can see more pictures on our Facebook page.